With F3125 Grade A325 heavy hex structural bolts, it is widely known that the “T” at the end of the grade, i.e. A325T, refers to the fastener being fully threaded rather than having a standard structural bolt thread length. At Portland Bolt the question of A490T bolt availability comes up regularly and the truth is they don’t exist in the marketplace. The reason behind this is because the old A490 specification did not allow for fully threaded bolts. This varied from the A325 specification which had a supplementary requirement specifically for fully threaded A325s with the marking “A325T”. 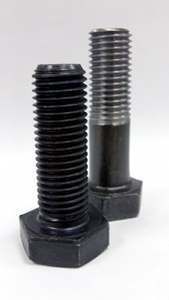 When the new F3125 specification replaced the A325 and A490 specifications in 2016, there was a new allowance for nonstandard thread patterns on structural bolts. Any fastener under the F3125 specification that has nonstandard thread lengths can be manufactured with an “S” stamped on the bolt, i.e. “A490S”. The “S” stands for “special”, meaning special thread lengths. These fasteners are not mass produced like A325T bolts so fully threaded A490S bolts will not exist off the shelf in the marketplace, however, they can be manufactured. If you would like to place an order for or have any questions regarding A490 or A325 structural bolts, give Portland Bolt a call. Our experts are standing by to assist with any questions you may have. What is the all thread rod equivalent for A325 and A490?